There a ton of blog posts raving about Makeup Revolution eye shadow palettes, and rightly so, but I've not come across too many posts about their mono eyeshadows and eye dusts. So when the above items landed on my door step, along with the Aqua Seal Liquid Eye Primer (reviewed just HERE) I couldn't wait to try them. Makeup Revolution have taken the cosmetic industry by storm, their eye shadow palettes have created quite a fuss within the blogsphere, amazing quality eyeshadows at such a low cost, so it's easy to forget that they actually sell other eyeshadows that cost just a mere £1! There are 45 mono eyeshadows in total (excluding the matte and merged mono eyeshadows) the two above are So Good To Me which is a beautiful shimmery golden brown shade, and Promised Land a neutral brown with a pink undertone to it, it's truly a stunning shade. They almost have a slight metallic finish to them, which for me personally, is a finish I really like and enjoy using. They're creamy to touch, have an intense colour pay off and are extremely blendable. 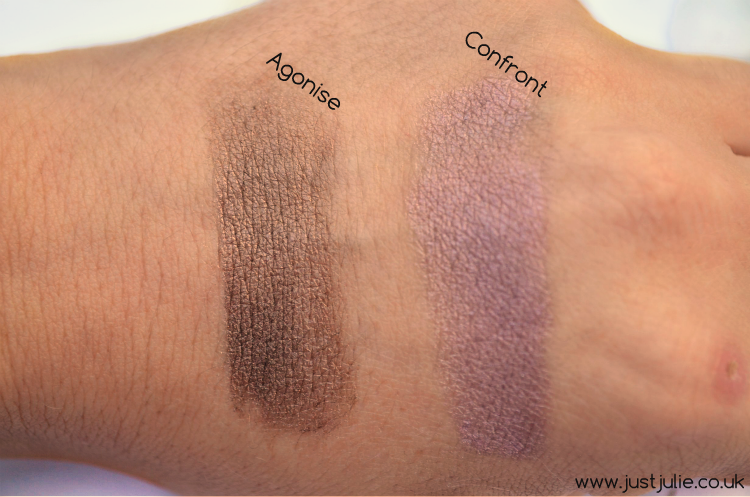 The fall out with these eyeshadows is ziltch. Absolutely no fall out what so ever, which is pretty rare with eyeshadows nowadays.. oh and did I mention that these cost just £1 each?! I've said it time and time again, the quality of Makeup Revolution products are just incredible considering the price. The packaging is what you'd expect from a £1 eyeshadow. Nothing fancy, but practical, especially as these are easily stackable. Which is something I need as my makeup is seriously overflowing.. I really need to get some more storage ASAP! 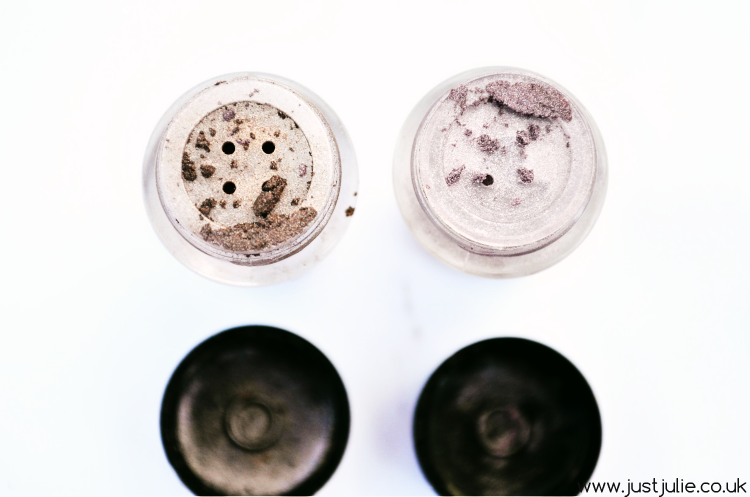 The Eye Dusts I was sent were Agonis which is a bronze shade, with a chocolate brown undertone and Confront, a lilac shade (sorry the swatch is blurry of this shade) I'm a massive fan of pigments and these two have made their way into my favourite pigments drawer within my Muji drawers. Like with all pigments, these do have fall out. There is not a single pigment on the market that doesn't, it's the price we pay for wanting an eyeshadow with intense pigmentation! Considering these cost only £1 each the packaging is pretty impressive. It comes with a fool proof dispenser, which means getting the product out is easy and you actually don't waste any product when dispensing the pigments out, which is great. 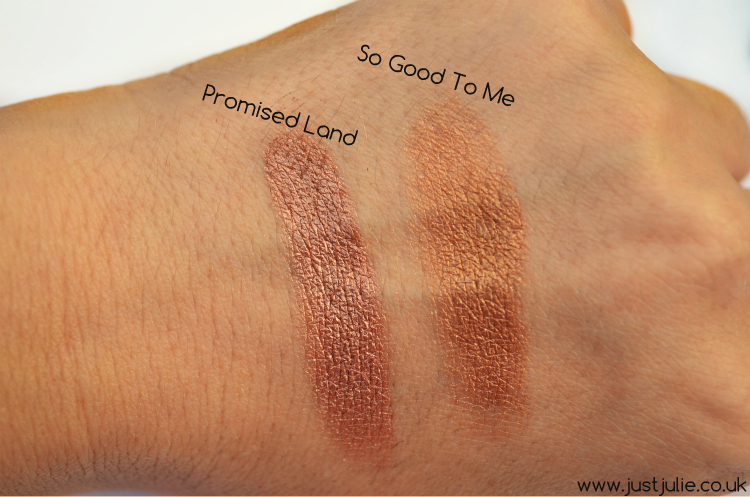 Pigmentation wise, these are pretty intense, a little goes a long way. These also look amazing when applied wet too, I wish now I'd done some wet swatches but have only just realised I should have done some as I write this! There is 25 eye dusts in total, and I'm not going to lie, I'm already eyeing up a few more shades to buy, I mean for £1, why not buy loads right?! 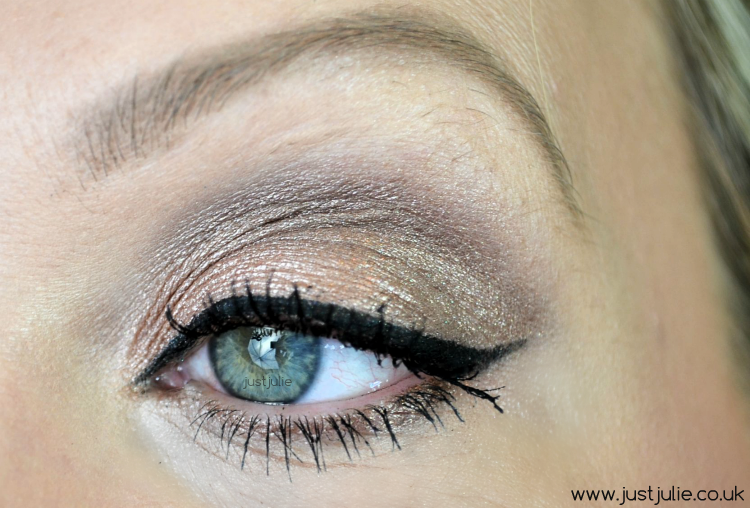 I created an eye look by first using the Makeup Revolution Aqua Seal Liquid Eye Primer (review link at the beginning of the post) all over the lid to prime my eyes, I then used Promised Land mono eyeshadow all over the lid and finally I used the eye dust in Agonis throughout the crease and out V area of my eye, I also brought the colour down under my eye! I really loved how look came out. This was a quick and easy eye look to create, which took me all of five minutes to do and really made the colour of my eyes pop! Oh please ignore the brows. They needed plucking badly and I was trialling out a new brow product, which didn't work out too well... as you can clearly see! 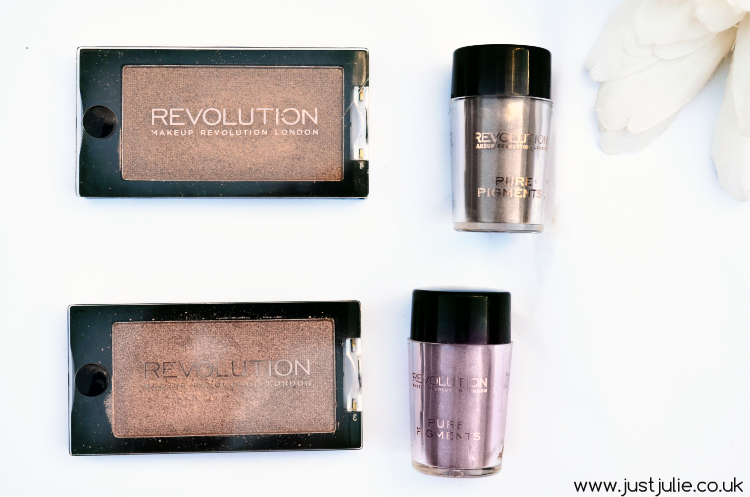 You all know how much I love Makeup Revolution so these shadows are a great addition to my makeup collection. 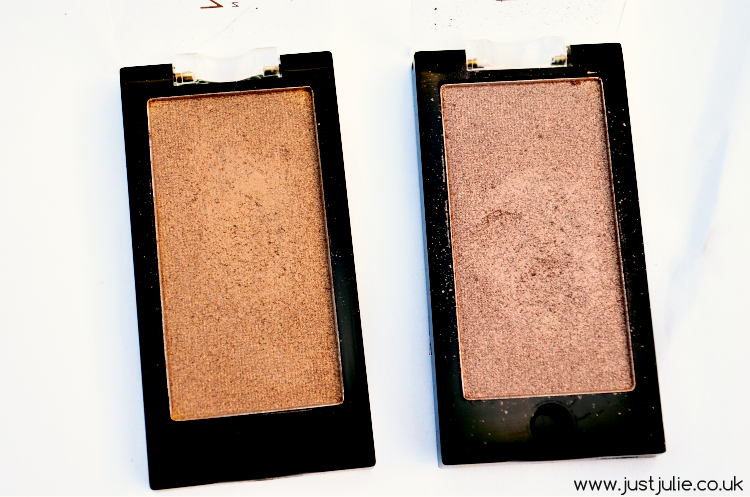 Have you used any of their mono eyeshadows and eye dusts yet?